I had never been to the west coast of Mexico, only the east coast, and I never thought it would be that great as I like to SCUBA dive, and the water is much warmer in the Caribbean rather than the Pacific. Boy was I sorely mistaken! Suman and I took a trip to Nuevo Vallarta, and it was FANTASTIC…especially for only $471!!! I recently joined a travel club, and this was my first “DreamTrip”. We used miles for an uneventful 3 hour flight on Southwest Airlines from Denver to Puerto Vallarta. We were happy to trade 20 degree weather for a balmy 82 degrees as we arrived in Mexico around lunchtime. Our all inclusive package included free transportation to our 4 diamond Marival Residences Luxury Resort, just twenty minutes north of the airport. While the white facade and block nature of the hotel towers doesn’t look terribly appealing, the interior of this resort and the landscaping addressed every detail. We were welcomed in the large, open air lobby with a lovely water feature before we followed our host into the Brunello Lobby Wine Bar where we were personally provided our hotel keys and wrist bands. Next we met our DreamTrip hostess, Tania, who was super cute. She was there to answer any questions we might have about the package which not only included FREE drinks and food with our suite, but also included a free excursion. We signed up to go to Yelapa on Saturday. I was happy to have our bell boy drive us in a golf cart to our suite in tower 3, so we could change into poolside attire! Our suite was bigger than the upstairs of my house. Two full baths featured travertine and intricate designs. Our granite covered kitchen included great appliances, and the dining/living area with attached balcony opened up to a view of the pool and ocean. The details didn’t stop there. Our welcome treat…chocolate covered strawberries. Our refrigerator…stocked with water, soda, and beer. Our bath products…from L’occitane. And our turn down service included slippers placed by our bedside and a different treat each night. I wish my drawers looked like this! Lunch at Lemon Grass, casual cuisine, outside by the pool was good. The most memorable dish was the tuna tartar. I think we may have ordered it daily. Fair warning, the serrano chili shrimp were HOT! We spent the rest of the afternoon in the terrific pool area. We had the choice of the main pool surrounded by lounge chairs with consistent drink and towel service, the hot tub with a waterfall backdrop, or the long, narrow quiet pool hidden behind a line of palm trees. The drink cart sounded like a good idea to us. For the evening, we decided to visit the residences’ sister hotel, Marival Resort & Suites. We took the free shuttle to go just a short distance down the road to an enormous resort! Signs pointed us everywhere as we searched for Las Palomas, a fancy Mexican fusion restaurant. The food was good and nicely presented, though not memorable. The resort seemed like a ghost town Wednesday evening, but when we returned a few days later to walk along the beach, the pools were packed!! While the beach was lovely, I highly recommend the Residences over the Resort & Suites…there is a big difference. For the next two days, admittedly, I was quite lazy. 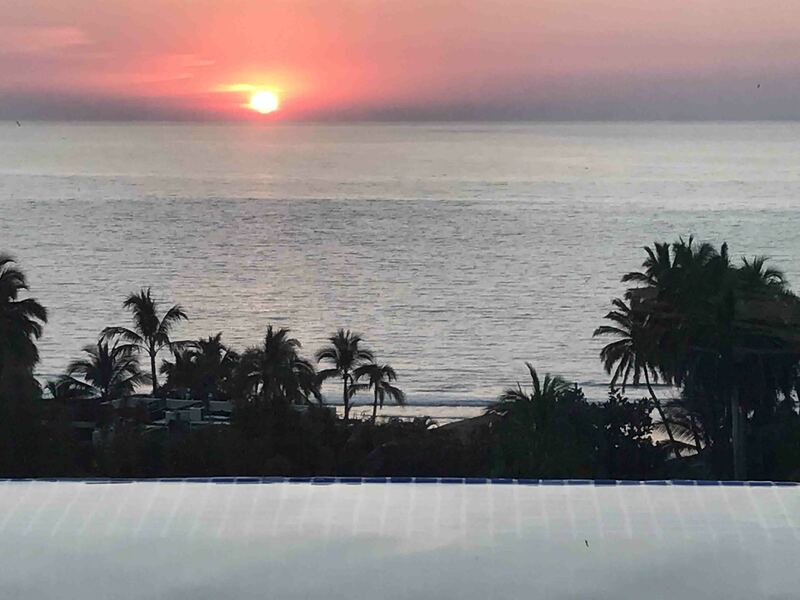 While I could have found a variety of excursions, like a tour of Puerto Vallarta, parasailing, ziplining, a free round of golf, tennis at the hotel, water sports at the beach and more, I chose to utilize the nice gym and spa in the morning and lounge by the pool in the afternoon. Suman had to work, so I generally joined her poolside for lunch and then up at Insu Sky Lounge for Happy Hour. The Insu Sky Lounge was located on the rooftop with a view of the pool and ocean. We loved how quiet it was in the late afternoon. We usually had the shallow, infinity pool to ourselves or were joined by Ed and his family. By sunset, around 6pm, the bar turned vibrant with lots of guests enjoying this super location. Insu offered an ecclectic menu…essentially tapas from many regions of the world. We had some tasty bites, but I still think the tuna tartar was the best dish thus far, even after trying Omaggio and fajita night. Saturday, we took advantage of our free excursion to Yelapa. We only had to pay $1/person for a taxi to Vallarta Adventure Tours. The company offers all sorts of outings. We boarded boat #4 for the start of our six hour day. Just as soon as we left the harbor, we were blessed to spot some humpback whales breaching in the distance! The season had just begun with the first sighting being the day prior. We slowly approached the whales and spent twenty minutes watching them fin slap, dive, and breach. What fun! We continued on to our snorkel destination which also provided guests the opportunity to paddle board or kayak. I almost didn’t snorkel because I read the water temperature was 61 degrees which is too cold, but it felt more like it was in the seventies, so I jumped in and swam over to the rocks. I loved seeing the King Angelfish, as these are not in the Caribbean. I also saw my first Zebra Moray Eel…totally cool. I was pleasantly surprised by the variety of fish in this small area. It would have been nicer if there was some coral, but that is not the type of diving on this coast. After snorkeling, we enjoyed a quality lunch and then continued on to Yelapa where our guide led us along the winding, stone sidewalks up to a wonderful waterfall. From the waterfall, we wandered through the town while admiring the marvelous murals and while getting a taste of the local life. Eventually, we made our way down to the beach where we lounged on chairs in front of a beachside restaurant and were very entertained with people watching. Vendors consistently asked us if we’d like to buy their wares or if we’d like a picture with a giant iguana. Soon it was time to make the long boat-trip back to Nuevo Vallarta. Fortunately, our crew doubled as lip synchers who loved to dance! We watched performances by Pitbull, Vanilla Ice, and Neil Diamond just to name a few impersonations. Even “Sweet Caroline” joined Neil on stage. It made the time pass very quickly, as it was quite funny!! Unfortunately, we had to bid farewell to super service, posh accommodations, and warm weather on Sunday around noon and mostly missed out on the amazing looking brunch. What made it worse was to come home to weather colder than it was when we left, though at least we missed the below 0 temperatures. We took United for our return as the fare was ridiculously cheap. The airline succeeded at getting us to Denver on time, but then everything fell apart. I think it may have taken longer to get from the airport to our houses than it did to get from Mexico to Denver! To start, the airport didn’t have a gate for us. After an hour wait, we moved to another gate where the escalator didn’t work thus many passengers struggled to carry their bags up the stairs. Eventually, we made it to the train station, only to find the train wasn’t working. “Yes, I thought you’d want to know,” Suman replied. Previous Post Another Blog Post Available on GPSMyCity! Next Post Is Cinque Terre on Your Bucket List? Take These Blogs With You on GPSMyCity!